As I write this post, I must admit I can't believe it's almost the end of January. Seriously, time is just whizzing by. But, I always look forward to Valentine's Day and planning fun treats for my cookie business (which I'm terribly behind on...just f.y.i.) and for my family and friends. Evan calls Valentine's day a "Hallmark Holiday" and doesn't get quite as giddy over it as I do, but we still celebrate in some small way nonetheless. Now, even though it's very true that I'm currently waist-deep in Valentine's decorations, heart-shaped cookie cutters and lots of red and pink stuff, I'm a gonna share a naughty, little secret with you all... my Christmas tree is still up. Shocking! I know. Yep, we are feeling super festive here! And our house is starting to resemble the lobby of a craft store... and I really need to take care of that before the end of the week. So, even though I'm dragging my feet on that tree, as usual I could hardly wait to get busy with some baking and these German chocolate cupcakes are seriously delicious. So, I'm pretty sure no one will disagree with a bit of extra, post-Christmas procrastinating so I can make them. But, if anybody happened to complain, I'm just going to ask them to eat a cupcake and enjoy it. Quietly. This recipe comes from one of the older Better Homes and Gardens cookbooks I own. The original recipe calls for regular sugar, shortening and sweet baking chocolate, but I've adapted it slightly by exchanging those ingredients with three of my favorite things on the planet: light brown sugar, butter and semi-sweet chocolate. When I first started out with this post, I planned to top the cupcakes with only the Coconut-Pecan frosting and it just seemed like something was missing. Then, I remembered that German chocolate cakes are always iced with some chocolate frosting too! So, even on a small scale, chocolate frosting had to happen with these cupcakes and I surrounded the coconut frosting with a pretty chocolate border. I used a disposable piping bag and a number 21 star tip to make the borders. But, if those aren't items you normally have around like I do, you can clip the end of a plastic storage bag, such as a Ziplock, and pipe them that way too. I'll just throw in my 2¢ here and say that if you bake often, it's worth it to invest in some of the Wilton disposable piping bags to keep around. You can use them for easy jobs like this one, even without special metal tips, and as a bonus they are recyclable! 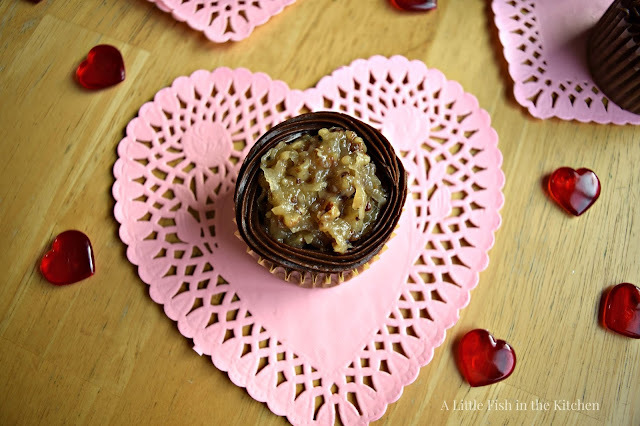 These cupcakes are super flavorful and pretty, and I think they are a perfect Valentine's day sweet for your sweetie! And, just in case you've ever wondered, the recipe for German chocolate cake does not come from Germany. The recipe is American and the cake is named after a brand of chocolate called German's chocolate. It was a type of sweetened chocolate created by a man named Samuel German in 1852 for the Baker's Chocolate Company. The first recipe for German Chocolate Cake was published in a newspaper in Dallas,Texas back in 1857. 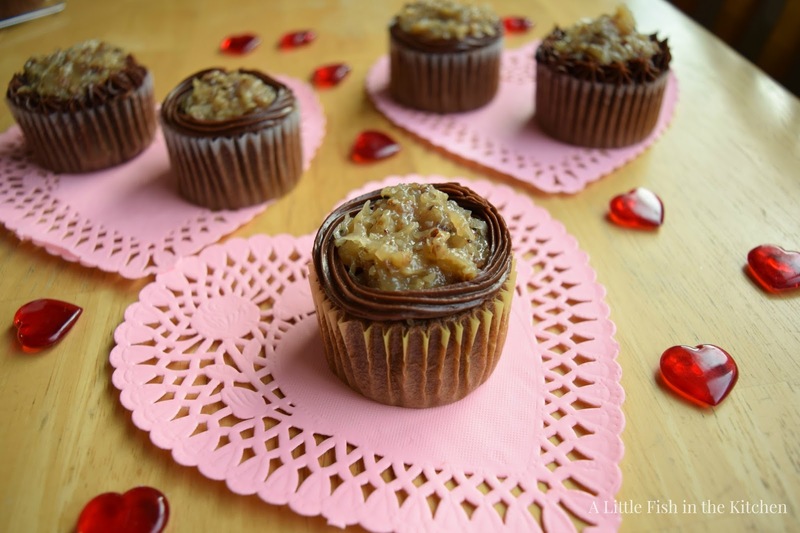 These German chocolate cupcakes are delicious and will impress even the pickiest of guests. Made with a rich, scratchmade chocolate cake and a scrumptious topping of caramel, coconut and pecans they are an indulgent dessert treat! 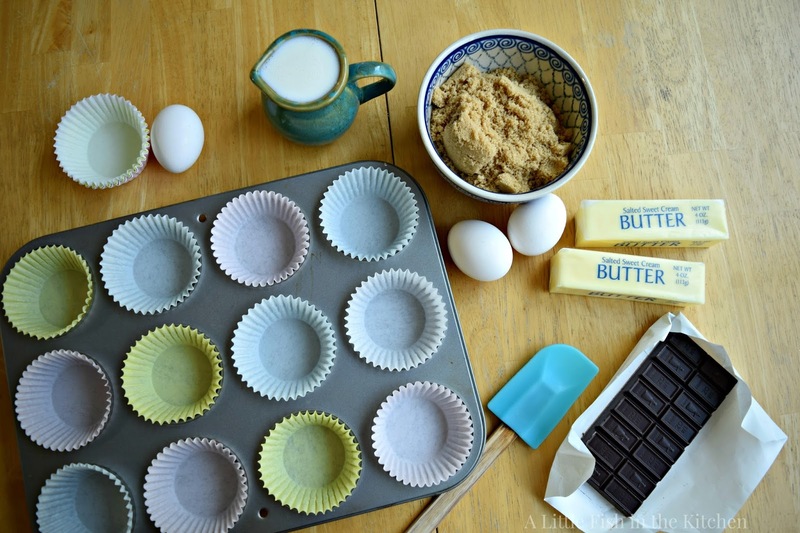 Pre-heat oven to 350° and line a muffin/cupcake pan with paper liners and set it aside. Mix the flour, baking soda and salt together in a medium-size bowl and set it aside. Break the chocolate bar into pieces and in a small saucepan combine the chocolate with a 1/2 cup of water. Warm and stir the chocolate mixture over low heat until it's melted. Remove from the heat, set it aside and allow it to cool. In a large mixing bowl or bowl of a stand mixer, beat the butter on medium speed for 3o seconds Add the brown sugar and beat until fluffy, about 2 minutes. Add eggs and vanilla, beat on low speed until all ingredients are combined. Stir in the melted chocolate and mix well. Add the dry ingredients and buttermilk alternately to the bowl, beating on low speed until the batter is just combined. (careful not to over mix the batter!) Use an ice cream scooper or a small ladle to fill each paper liner to 2/3 full. 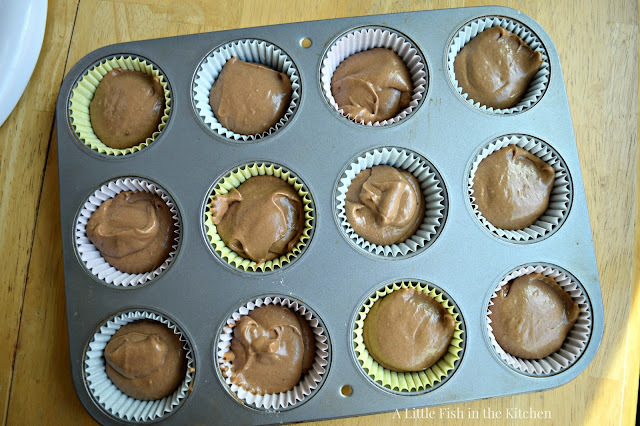 Bake for 13-15 minutes or until a toothpick inserted in the center of the cupcakes comes out clean. Allow cupcakes to cool completely. 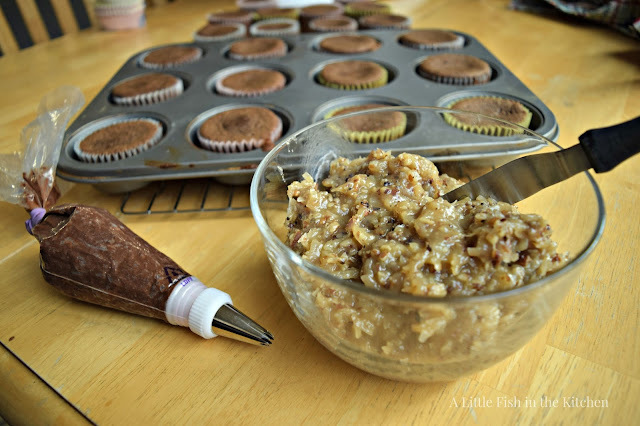 Top each cupcake with a heaping teaspoon of cooled Coconut-Pecan frosting in the center. Pipe a simple border around the edge of the cupcake with chocolate frosting, if desired. In a medium saucepan, beat egg slightly then stir in the evaporated milk, sugar and butter. Cook the mixture over medium heat, stirring often with a whisk, until it thickens. (should be about the consistency of glue, about 12 minutes). 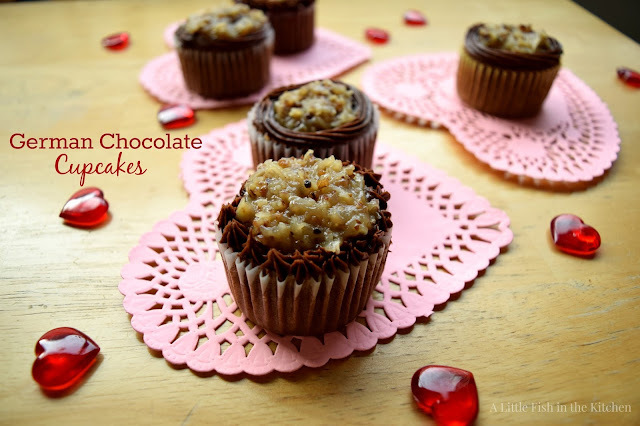 I love the idea of making German chocolate cake into the cupcakes. I love esp. that coconuty topping! Hi Marcelle, these are absolutely gorgeous, you are such a great baker. Love that you used canned frosting for this (shortcuts are good). I will have to pick up a piping bag. Take care. Hi Cheri! Yes, sometimes shortcuts are just good ideas! :) Thank you! I love German chocolate anything!! Your cupcakes look fantastic!!! Hi there Liz, thank you so much! Thank you for the background on German chocolate! Something I never knew. Hi Marcelle your cupcakes look so pretty. Love the piping. I need to add this to my list of cupcakes to make, because I love the flavor. Thank you for sharing at DI&DI. Have a great week. these are perfect, especially since i always seem to cut myself a mega slice of german chocolate cake. built-in portion control! Love how moist and delicious these little German Cakes look. I LOVE German Chocolate cake! Such a great flavor. And these cupcakes? They look wonderful. Can't believe February is already here -- this year is moving at warp speed!